Recently we were able to get into contact with Valve with a few questions regarding the newest and prettiest TF2 map, CTF_Doublecross. 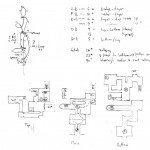 Although level design is approached as a team effort at Valve, Valve mapper Iikka Keranen, as the original designer, was kind enough to answer them and provide us with some tips as well as insightful concept and development shots of the map. IIKKA: The cylinders trick is a good one. Basically, you start with cylinders that are built along one axis and then just rotate the brushes and vertex-edit to get back on the grid. The most laborious part is the joint between a straight and a 45-degree pipe; when you clip the brushes in an angle where they meet, the displacements won’t match. You need to first sew them and then tweak with one-unit steps until it looks good enough. The down-slope is done easily by lowering the bottom vertices; that portion of the pipe is just skewed rather than rotated. Texture alignment is key in making it look good. IIKKA: Unfortunately area portals are always two-way. This would require new technology. 3. 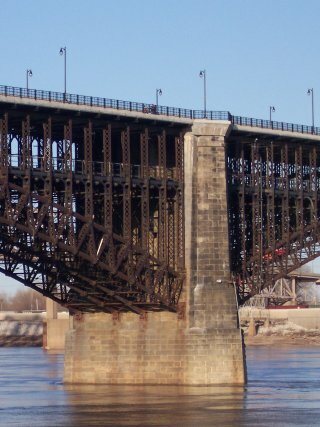 NODRAW: Is there anyway the clips can be taken off the middle two towers’ rooves? These always seem jumpable as the battlements are nearly the same height. IIKKA: The towers have differing geometry that gave the BLU team an advantage before their tops were clipped. They were built rather late in the development to replace a different obstacle that you couldn’t jump on (a tall tree on the edge of the cliff) and the clip brush was deemed the best solution to the problem. 4. 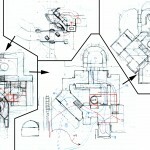 NODRAW: When working at odd angles, how do you keep track of it all? E.G. the X shaped supports near spawns that are angled on both Z and X axes. 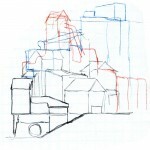 IIKKA: I’ve built a lot of stuff in odd angles (since dod_avalanche) so I’m just used to it. But there’s a few tips I can give you to get you started. Building in a 45-degree angle is easiest when you assume that 96 units diagonal equals 128 units along an axis. This not only lets you stay on a reasonably large grid, but the miter joints between the angled and axis-aligned architecture will be in a simple 2:1 slope. For example when a 16-unit thick straight wall meets an angled one, you just need to move the corner vertices by eight units (or clip in this angle). In general, when building in an angle you should establish a large “angled grid”, like an equivalent of 128×128 squares. As an aid, you could make a checkerboard of diagonal squares out of “Skip” material and place it below your level so you can use it to help you align stuff in top-down view (I sometimes do this on graph paper). Start large, and subdivide the grid later when you’re building smaller details. This is useful when building axis-aligned things as well. When designing a sloped roof in an angled portion, again stay on as large a grid as you can. Let’s say you want a roof like in the room leading to the battlements in Doublecross. Start by making a slab aligned to your diagonal grid. Then raise the vertices on one side by 64 units for each 128-unit-equivalent grid square that the roof spans. This results in a fairly standard slope and makes it easy to fit beams and such to it. 5. NODRAW: Was this pre, post, or during meet the spy? I.E. the reference made by the spytech warning board. IIKKA:It’s never as simple as that. 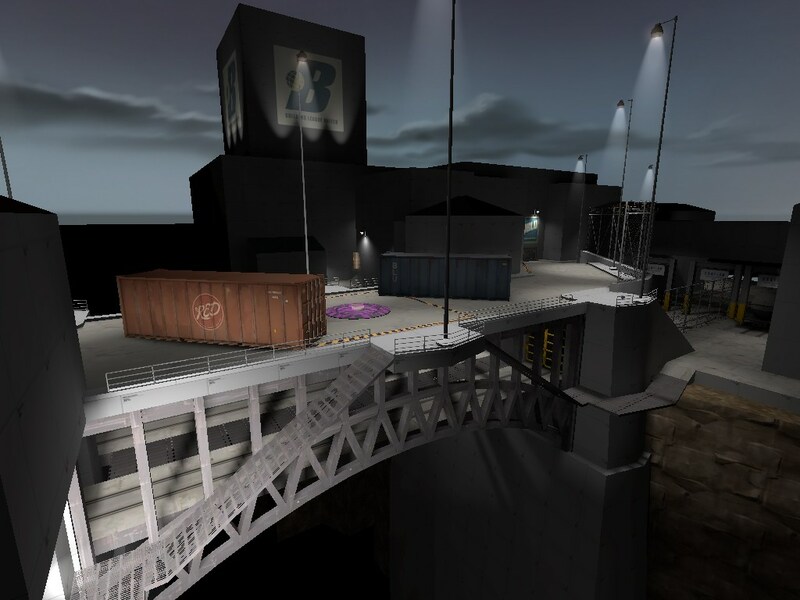 The earliest files I have with elements that lead to this map (the bridge) are from August 2007; but the bulk of the development as a CTF level has been since the summer of 2009 ie. after the Meet the Spy video… It wasn’t really built specifically to house the announcer board, it just fit in perfectly and is appropriate for a CTF map. 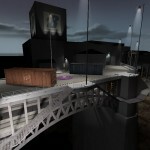 Back in 2007 when TF2 shipped, I started to develop a capture point concept level with a night time setting, called cp_nightfall. 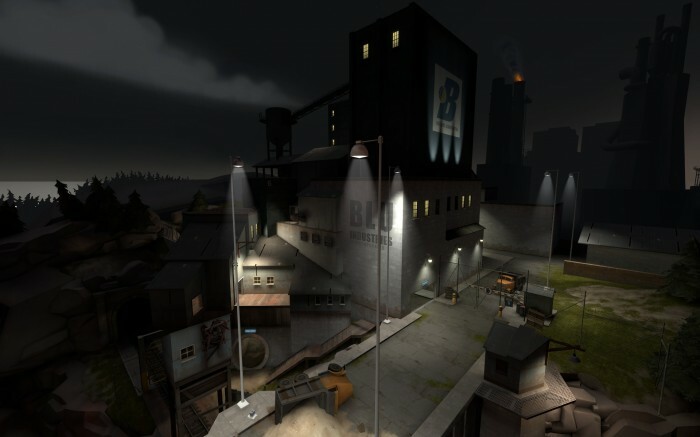 Night levels hadn’t been done in TF2 before and there was some interest in developing this as a new artistic theme to be released in a later update. I abandoned it a few weeks later and began to work on cp_badlands. Both levels had a similar layout and theme besides the lighting, and we had already invested time and effort into artwork for Badlands so it was an obvious choice. Later I moved over to Left4Dead so Nightfall was left sitting on the shelf. 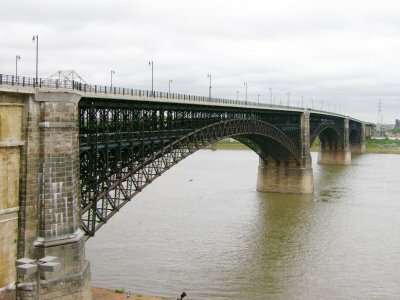 Note the double-deck bridge with railroad tracks on the bottom level (based on Eads Bridge in St. Louis MO, photos below) and the triple spotlights lighting the BLU logo. As Left4dead neared completion and I had some idle time between playtests, I began to think about CTF levels. 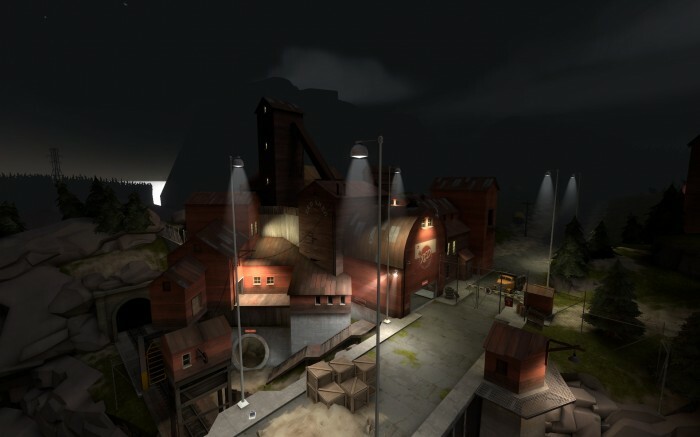 Earlier there had been a tendency to only think of new TF2 levels in terms of capture point gameplay, but it soon became clear that there was an audience for CTF as well as 2fort remained the most popular level. 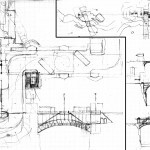 I talked with other level designers to find out what they thought were the strong and weak points of 2fort, and spent some time playing and analyzing ctf_2fort. 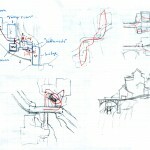 This scan has some of my notes from this time, measuring various travel distances. I took Nightfall out of the drawer and started to think of how to use it as a base for a CTF level. 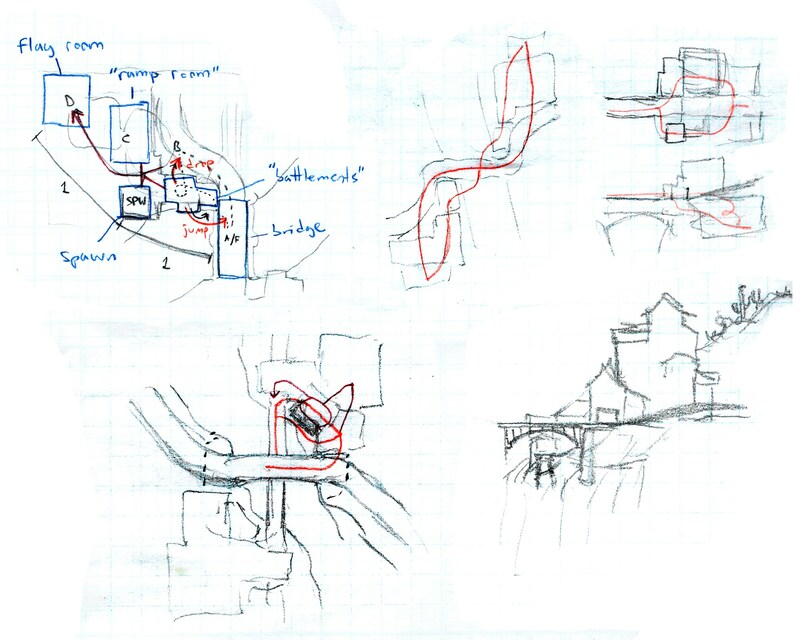 Initially I took the flow times from 2fort and placed path intersections at roughly the same distances, although the spaces themselves were dissimilar (e.g. point B on the street outside the base corresponds to the inside of the entryway in 2fort because the paths from the top and bottom of the bridge meet there). I considered a couple of different layouts with the double-deck bridge until I finally came up with the bridges crossing at different heights, which seemed to allow a dramatic vertical feel to the center area and a compact instant-action layout. 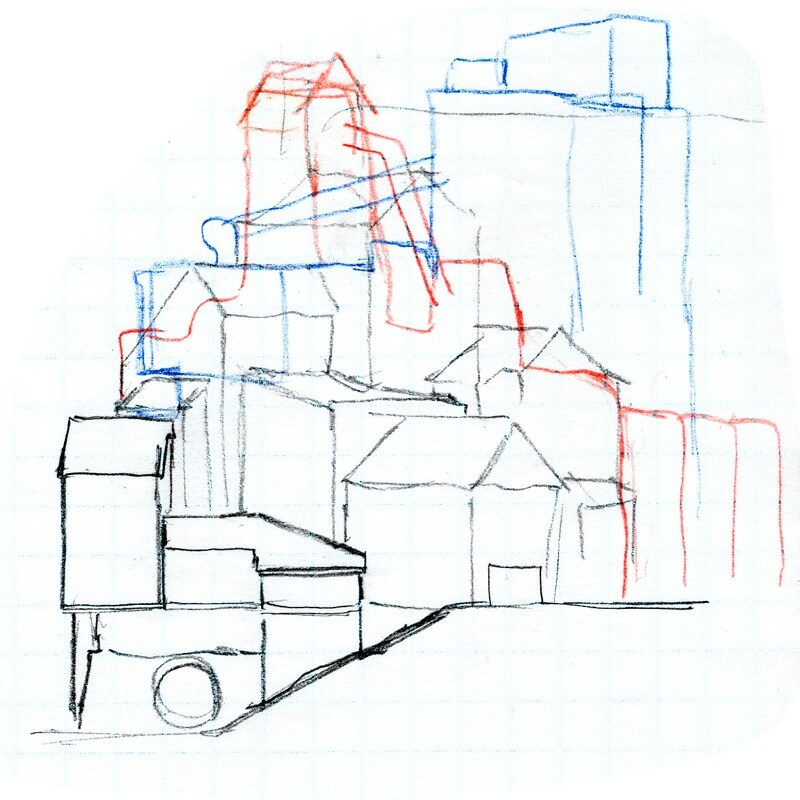 I sketched the silhouettes of the two bases with different colored pencils on top of an elevation drawing of what I had built as the base façade. It looks like a mess here, but the final results look pretty much as I imagined. 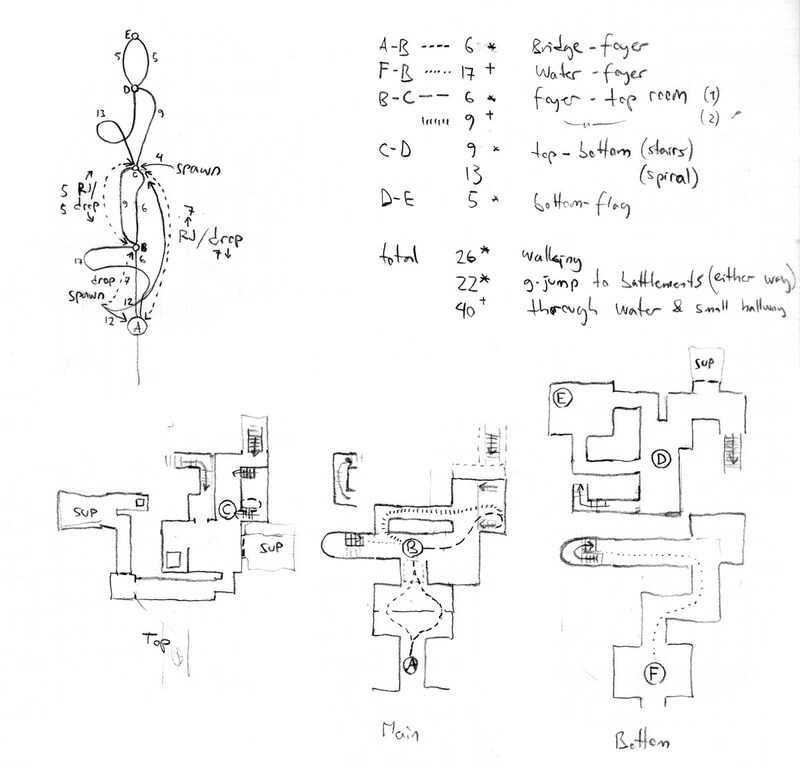 The inside of the base went through multiple layout designs even before the first playtest. 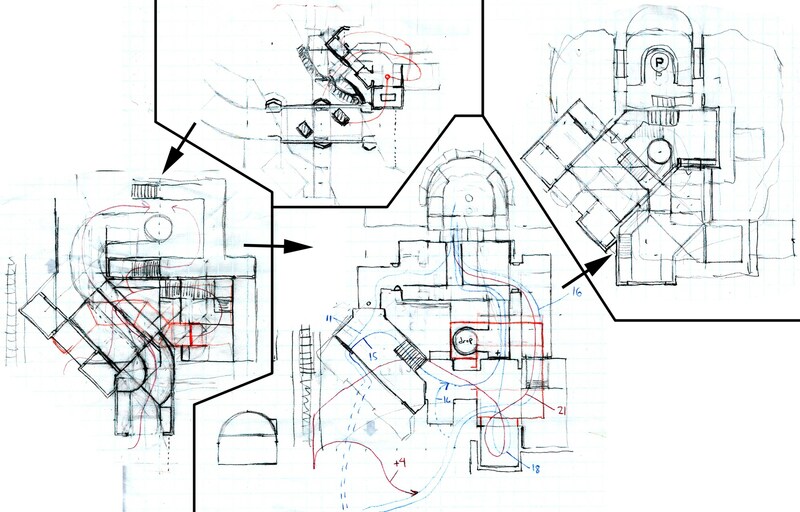 In particular the main path from the front door to the flag changed radically, from a TFC style entrance that splits in two and reconnects, to a “roadway” through the battlement room, to a series of interior rooms and finally to the open back courtyard that exists now. 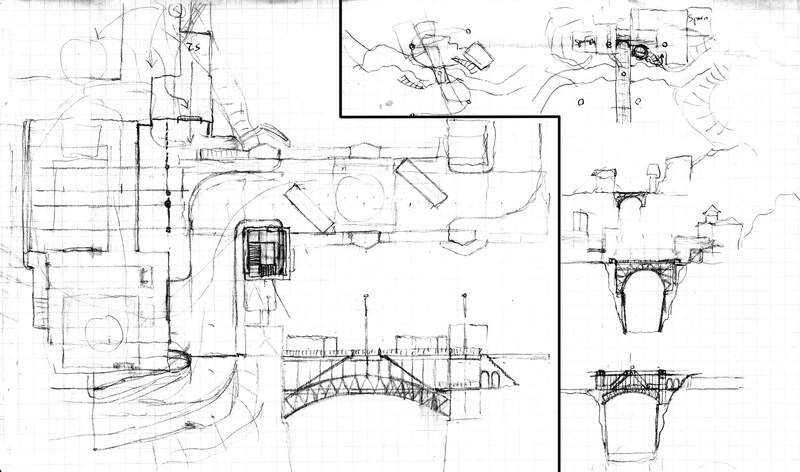 After the last sketch, there were still more changes based on playtest experience: removal of front stairs to spawn floor, making the back entrance to the flag a one-way drop, adding an underground tunnel from the courtyard shed to the sewer, and changes to the architecture between the spawn and the stairwell. Thanks so much Iikka! Let’s all do our best to put some of these tips into practice. Sidenote: Compare Iikka’s paintover of the two respective buildings to these doublecross screens taken at identical angles. This entry was posted on Tuesday, January 5th, 2010 at 10:59 PM	and is filed under Interviews. You can follow any responses to this entry through the RSS 2.0 feed. You can leave a response, or trackback from your own site. discover what the residence rules to get a game are.